Back in March, we reviewed The Dragon and the Raven for you guys. When we were asked to review another great product from Heirloom Audio Productions called Beric the Briton, we jumped at the chance. When I say jumped, I mean really jumped. My son jumped up and down over and over in excitement. I’m definitely checking into other titles in the G.A. Henty adventures for his christmas gift. My kids love listening to audio productions and this one did not disappoint. We took a few days and listened to Beric the Briton in the evenings before bed. Every night the kids groaned when I paused the CD so we could continue the next night. They were so intrigued that I believe they would have sat right there on the couch the entire duration if given the chance. 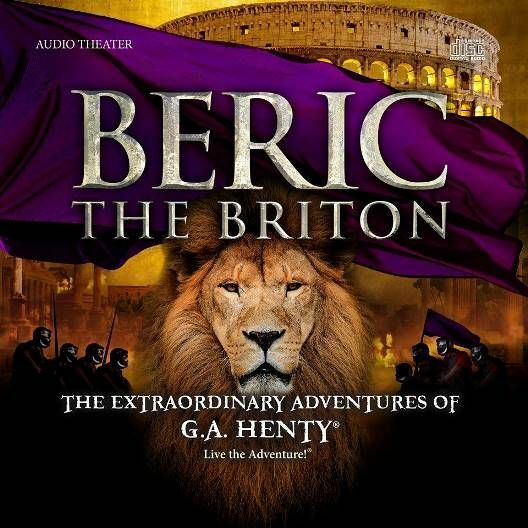 Beric the Briton is a 2 CD set with over 2 hours of audio drama. This time, in G.A. Henty’s adventures, we can join Beric and Bodouc as they are trained as gladiators and placed into the service of Nero during the Roman invasion! Through the audio adventures, you will hear as Beric and Bodouc are forced to face their Pagan past and overcome many obstacles. The Heirloom Audio Production mission includes bringing Christian history to life. With the CD set, you’ll also gain exclusive access to lots of bonus products! The study guide includes ways to help your child remember what they have heard, think about the lessons learned, and even grow their vocabulary. The questions and activities are broken up in sections and clearly labeled with the areas to stop and discuss from the CDs, as you can see from above. All help point the children into understanding some wonderful lifelong concepts of courage and bravery. As with The Dragon and the Raven, we just loved listening to the adventures in Beric the Briton. The sound effects are so wonderful that you feel like you’re actually there in the story as well with the gladiators and soldiers! It was very well done. As a mom, I appreciate knowing that I do not have to worry that the kids will hear something inappropriate. This audio drama is geared toward children. There is so much that I want to tell you about the story, but I don’t want to ruin it for you. All I can say is that it keeps you on the edge of your seat and thirsty for more. No complaints from me! For more information or to find more adventures of G.A. Henty, visit the Heirloom Audio Productions website. You can also find Beric the Briton on Facebook, the G.A. Henry series on facebook, Heirloom Audio Productions on Facebook, Twitter, Google+, and Instagram. If you’re interested in hearing a little of the story, click here to listen to a few excerpts. You can also find more reviews for this product by The Old Schoolhouse Review Crew by clicking the banner below.